Load equalizing dollies use specially formulated,non-marking synthetic wheels for the ultimate in floor protection. In the 14, 28, and 42 ton sets, individual wheel loads are less than 1500 lbs. at rated capacity. Wheels are fitted with high quality ball bearings for low rolling resistance Steering dollies have oscillating "wheel boxes" to prevent edge loading. The design of the system insures equal load distribution over the multi-wheel arrangement. Steering dolly wheels are located on either side of the swivel, allowing counter-rotation around theswivel when being turned. In many cases the swivel dolly may be turned while stationary. All dollies have fully supported axle ends. This helps prevent axle flex as is common in cantilever style units. Fully enclosed frames help prevent edge loading of the wheels. 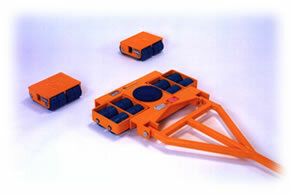 The modular format allows conversion to a four point system when required, or the rear dollies may be used alone without the swivel dolly. The system may be easily disassembled without the use of tools for easy transport. Wheel bearings are set directly into the synthetic wheel. This prevents delamination of the synthetic wheel from a metal "hub". This also allows the wheels to be cutdown should they pick up any chips or debris. Swivel plates are mounted on ball type thrust bearings. 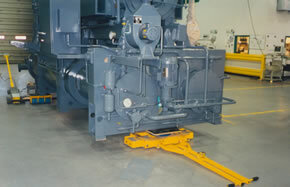 The swivel plate may be easily removed and duplicated in steel for machinery with skirt type bases or legs. The steel swivel may then be easily adapted with flanges, studs, or tapped holes to accommodate these applications. Load equalizing dollies are also available with aluminum wheels. They offer greater durability in applications that do not require the same degree of floor protection. Call for free color brochure. Dollies come in many different styles. 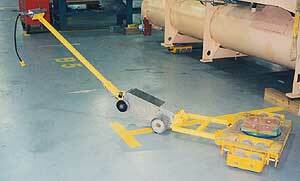 We can evaluate your application for dollies and determine the most suitable for your needs.